What happens when a desperate man seeks a 21st century marriage of convenience? Confirmed bachelor, Nigel Turner, needs a wife in order to inherit his father's millions. And he needs one in short order. His only option—other than kidnapping, which is illegal—is to use the Internet site Rent-a-Bride. 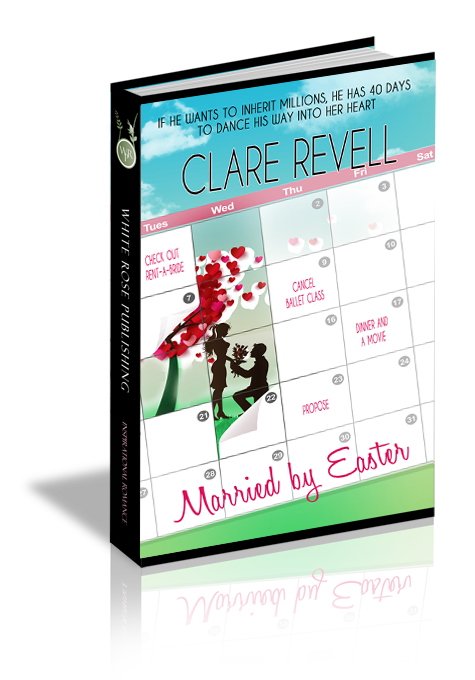 Chloe Wilkes’s brother signs her up on Rent-a-Bride as a joke, but when Nigel's details end up in her inbox, she decides to get her own back, and reply. Neither expects to fall in love with an arrangement that was meant to be temporary. How much better is your love than wine and the fragrance of your perfumes than any spice! Dr. Nigel Turner loosened his tie and shifted uncomfortably on the chair. It was stiflingly hot inside the lawyer’s office, despite the freezing cold winter’s day outside the tall, imposing building. His father’s will had turned out pretty much as he’d imagined. His brother, as the second son, had been left a large amount of money and the microchip company. The valet had been left a small sum in return for thirty years loyal service. And the house, grounds, and fortune of several million had been left entirely to him as the eldest son. No, there were no surprises whatsoever. Not even his father’s sudden death at fifty-seven from a heart attack, given the fact he’d never had a day off and worked every hour he could do. Their relationship had been tempestuous at best, frosty at worst. Even so, the house was empty without the stern presence of his father. “We’ll see about that. Good day.” Nigel shoved the door open and left, not bothering to close the door behind him. Now what did he do? His web of lies had finally come back to catch him out. He’d invented the girlfriend to get his father off his back for the last year. His father had kept going on about marriage and the lack of women around the place, so in a moment of utter frustration, Nigel made up someone. He gave his father very good reasons why she couldn’t visit or stay over for the weekend. He had no idea it would come back to bite him like this. As a Christian, he should have known better. Lying was wrong. Pure and simple. There was never a justifiable reason to lie. The small fib had snowballed exponentially, until there had been no going back. He’d been about to tell his father he’d broken up with his “girlfriend,” a lie to compound the lie, but he’d died before Nigel had the chance. He looked at the chauffeur. “Home, James,” he quipped. The reality of that statement hit him in the gut. How could he have been so stupid? Outside in the cold air, he closed his eyes and drew in a deep calming breath. He’d go to the church. He needed to pray. Brisk steps took him through the alley and down several side streets to the church. How was he supposed to find a wife in the forty-eight days before Easter? Never mind one called Chloe. “A lie is a lie. Just as a dog is a dog, small or large, it doesn’t alter what it is. You need to pray.” The stranger’s deep voice struck a chord in Nigel’s heart. Nigel buried his head in his hands, fingers tugging through the tight curls. Groans tore from him as he prayed. When he looked up, he was alone. By his feet lay a discarded flier. He reached out and picked it up, intending to put it in the next bin he passed, but the words at the top of the page caught his eye. Rent-a-bride. He glanced heavenward for a long moment then back down at the colored paper. There were no more details, just a website and a couple of pictures of women in long white wedding dresses. Once home he locked himself in his bedroom and sat at the desk with the laptop. The website was a simple affair. It gave no clue as to how much it cost to actually rent a bride. It simply said they charged a joining fee, and there was a connection fee for forwarding mail to the women. It was then up to the individuals if further contact was made. Nigel didn’t hesitate. He joined the site and once his password came, he had access to the database. He just hit random links until the unthinkable happened. She looked almost exactly as he’d imagined. Long brown hair which fell past her shoulders. A smile to die for. Brown eyes that seemed almost the same shade as his own. She was pretty…oh, so pretty. No immediate answer came, but then he wasn’t expecting a lightning bolt or something along those lines. What did he have to lose? This was purely business, nothing more. Nigel clicked on the link below Chloe’s name and started to write.